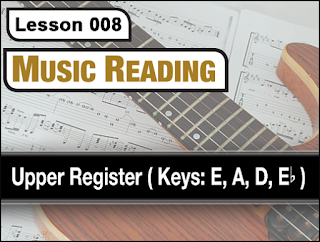 Lesson 008 of Music Reading Lesson eight "Music Reading" continues study of the fingerboard in the upper register of the guitar neck. Four reading exercises use four key signatures located within the upper register of the neck's "10th, 11th and 12th" positions. 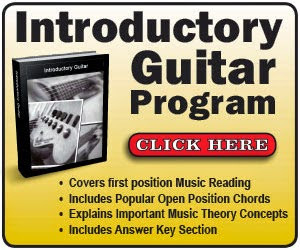 This guitar music reading course is not designed to be used as a "beginners" reading curriculum. 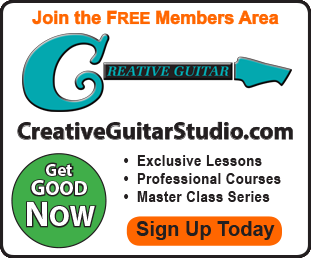 If you have no prior music reading experience on the guitar, it is strongly advised to first study the Creative Guitar - Introductory Guitar Program, as well as, the Intermediate Guitar Program. (1). 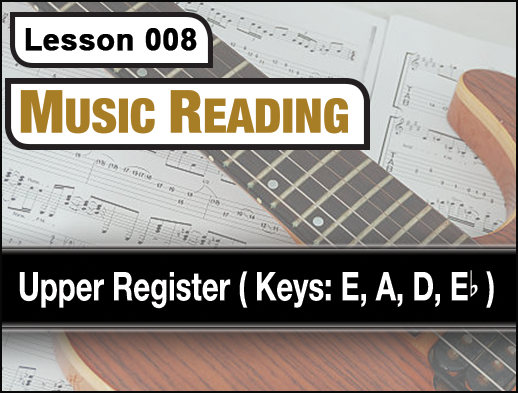 Part one, of lesson eight Music Reading, studies exercises designed to develop reading skills in the 12th reading position within the key of "C Major." Scale tone range is established from the low 6th-string "E", up to the high 1st-string "G" at the 15th fret. (2). Part two, introduces the key of "G Major" across the 11th and 12th position. 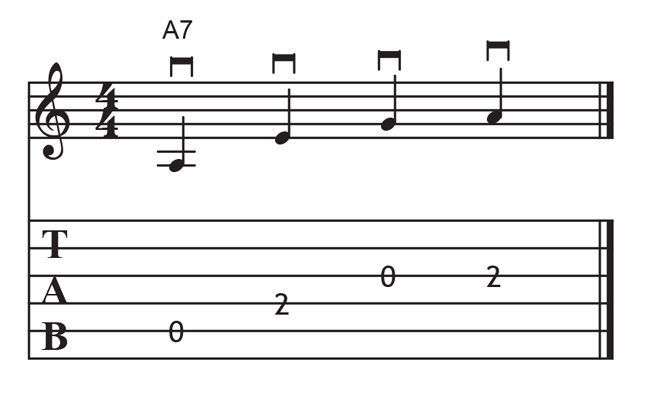 Scale tone range is established from the low 6th-string "E", up to the high 1st-string "G" at the 15th fret. (3). Part three, introduces reading in the key of "Bb Major" with notes located within the 11th and 12th position. 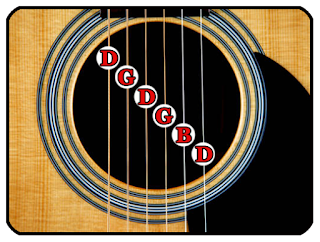 In the range layout, scale tone distance covers notes from the low 6th-string "Eb", up to the high 1st-string "G" at the 15th fret. (4). Part four, introduces reading in the key of "F Major" with notes located entirely within 12th position. 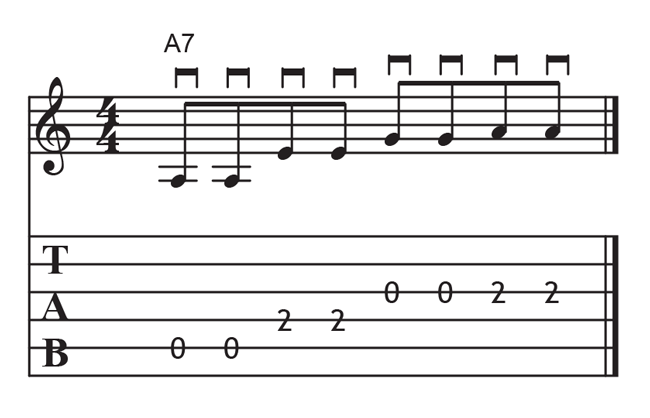 Scale tone range is established from the low 6th-string "E", up to the high 1st-string "G" at the 15th fret. (5). 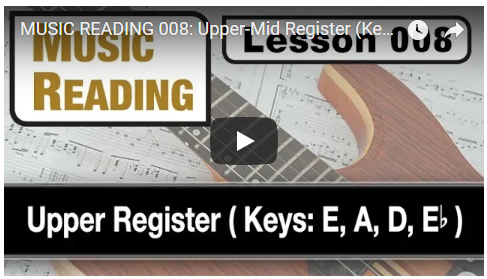 Reading Exercise: The upper-mid register summary piece for lesson five is a 16-bar melody that blends the 11th and 12th positions together covering all of this lessons key signatures (C, G, Bb and F). Study the notes to staff layout of the key of "E" across the 11th position. PART TWO: Study the notes to staff layout of the key of "A" across 10th, 11th and 12th position. Study the notes to staff layout of the key of "D" across 10th, 11th and 12th position. PART FOUR: Study the notes to staff layout of the key of "Eb" across 11th and 12th position. In this post, I’m going to cover the unique scales topic of performing, "Compound Scales" using the Pentatonic Scale. While the Pentatonic scale is not the only scale that we could explain this topic with, it is a good one to learn from because it’s one of the most popular scales used by guitar players. I’ve certainly used Pentatonic like crazy, and I’ve taught it to hundreds of other guitar players who’ve also used it like crazy. The only difference is that this time our version of this scale will be done using Compound Scale design. We’re going to focus on the ‘F’ Minor Pentatonic in our example, but the principle that I’m about to show you - can be done with just about any version of the pentatonic. The idea - operates around taking two Pentatonic patterns and learning how they sit side-by-side. Then, instead of playing them separately, we’re going to “catch-up on the space in-between” by playing both patterns at the same time. So, as you can tell, this idea (of using up the space in-between our Pentatonic patterns), certainly isn’t exactly revolutionary. The principle behind Compound Scales is in fact very straight-forward. So, try it out with a collection of Pentatonic scales, in a number of keys and try using it when improvising. I hope that this lesson on combining the space between Pentatonics was fun for you... If you’d like to learn more about how to further develop your guitar playing - join my web-site as a free member and start taking a look at all of my “Guitar” Courses. The courses cover a ton of specific information on improving general and advanced playing skills. Plus, there's a wide assortment of lesson plans. The lessons all have very detailed videos along with PDF worksheets (that you can download and print out), to start covering all types of; exercises, Music Theory, rhythm training and technical drills. 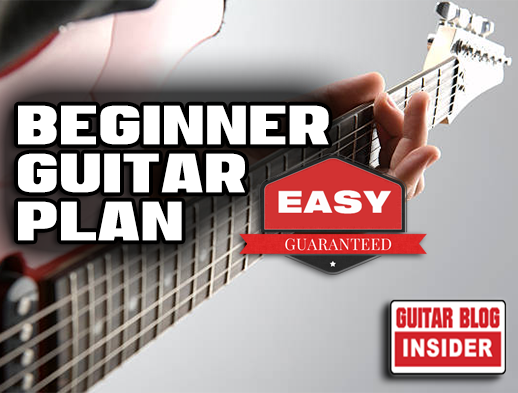 Each lesson is well planned and easy to follow – and they all work together in a very organized way to help you get better at playing guitar in record time. I’ve spent over 25 years working with hundreds of guitar students creating thousands of detailed step-by-step guitar lessons for both my website members and my private students. The result is the most comprehensive guitar course that covers every aspect of beginner to advanced playing ideas to help you improve your playing. 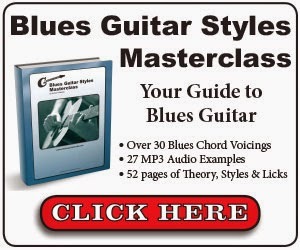 If you join my site as a Premium member, you’ll receive a FREE copy of my popular Guitar Technique eBook. My Guitar Technique eBook is 28 pages of jam-packed exercises, drills and studies for mastering all of your technical skills at playing Guitar. 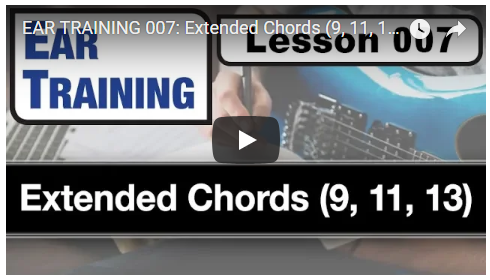 Lesson 007 of Ear Training Lesson seven of "Ear Training" focuses on the sound and structure of developing Extended chord types of, "9, 11 and 13." If you have no prior experience with basic music theory, basic rhythm, key signatures and how scales work on the guitar, it is strongly advised to first study the Creative Guitar - Introductory Guitar Program, as well as, the Intermediate Guitar Program. 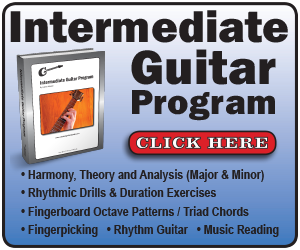 If you are a guitarist that has no background in basic music theory, key signatures, treble-clef staff /note recognition, or foundational rhythmic duration, then it is advised that prior to working on this course, you study the "Introductory" and "Intermediate" guitar player programs prior to working on this course. Those preliminary courses, (for beginners and Intermediate players), will lay the foundation for understanding how the nuts and bolts of ear training relate musically and how the principles relate to guitar (as well as other instruments). The preliminary courses will also help guitar players better comprehend rhythm duration and key signatures. (1). 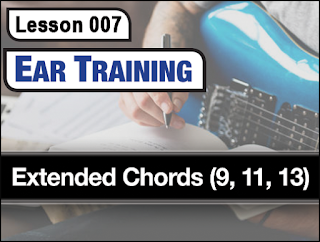 Part one, of lesson seven Ear Training introduces the sounds of "Major and Minor" 9 chords. These chords are created by adding a Major 2nd interval (9th) an octave above the tones of a Major or Minor 7 chord. The lesson contains exercises involving pitch matching of these 9th chord types. NOTE: The 11th chord extension does not function on "Major" or "Dominant" chord types due to the clash that exists between the Major 3rd and the Perfect 4th (11) of this quality. The, "Dominant 11 (sus2)" chord consists of a; Root, 9th, 11th and b7 chord structure. 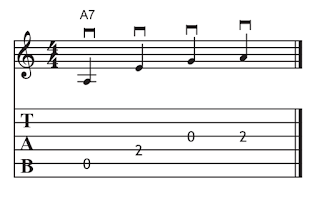 The "Minor 11" chord includes the tones of a "Minor 7" chord with the addition of a Perfect 4th (11th) up an octave. (5). Audio Track Training Exercises: Use the MP3 audio tracks (contained within the lesson download), to study the sound of each "Extended" chord. These chords on the table (provided on page 5 of your PDF handout), are performed upon both the guitar and on the digital piano. Sing and match pitch to each arpeggiated interval as they are performed on the audio tracks. Developing Major and Minor 9 chords. Learn associated Major and Minor 9 chord ideas for being able to determine the sound of stacked intervals that create these popular compound interval chord types. PART TWO: Developing Major and Minor 13 chords. Learn associated Major and Minor 13 ideas for determining the sound of stacked intervals to create these popular compound interval chords. Developing Dominant 9 and 13 chords. Learn the associated Dominant 9 and 13 ideas for learning how to start determining the sound of stacked intervals found within the Dominant 9 and 13 compound interval chords. 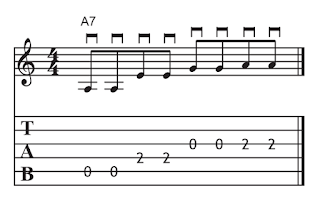 PART FOUR: Developing Dominant 11 (sus2) and Minor 11 chords. 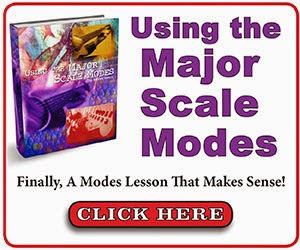 Learn associated harmony and theory ideas for learning to determine the sound of stacked intervals found within these chord qualities. This post is going to be focused on learning a few simple phrases that can act as a jump-start to a beginner guitarists repertoire. Before we get started, the first thing I need to mention up front is that it’s really important (prior to learning how to start playing music on guitar), that you spend some time and learn the; names of the guitar parts, how to keep the guitar in tune and how to sit properly with the guitar. 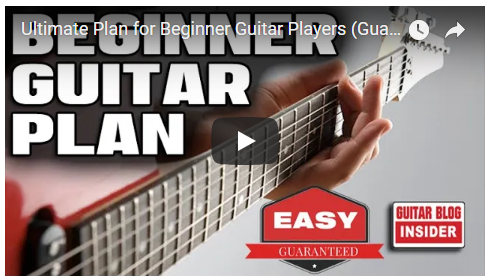 Fretting chords, switching chords and strumming chord changes can be a difficult area to start from when it comes to beginners learning how to play guitar. An easier way into guitar is to learn how to play chord outlines. Guitar technique is critical when it comes to learning this instrument. 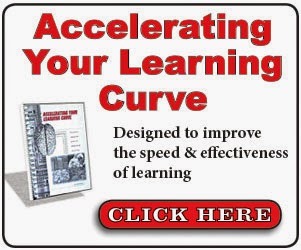 Technique involves both accuracy and speed and these are important to start integrating as quickly as possible. This next example that I have for you, is going to simply take the study that we practiced back in example one, however we will perform each note twice. 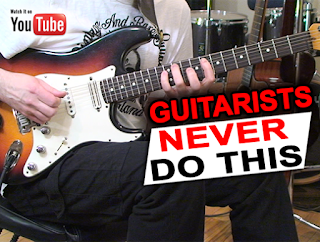 Once you have some of the basics down that I’ve mentioned so far, and once you feel like some of these riff examples that I’ve just demonstrated here are starting to feel more and more easy to play, I’d suggest trying out some chord ideas next. Full size chords (found in most beginner guitar books), can be intimidating. 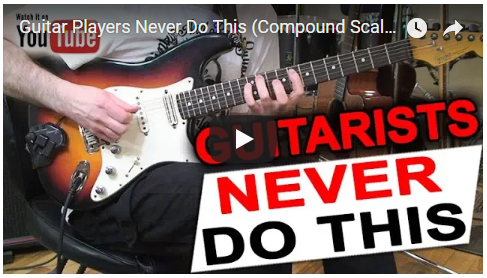 And, some chords like the “F Major” and the training involved with making, “Barre Chords” can feel like those chord patterns seem pretty much impossible at times. My suggestion is to learn much smaller "pieces" of chords. Rather that the text-book large 5 and 6 string layouts, just try starting instead with only 2 or 3 strings. Once you have those down, move onto 4 strings and after that you can add even more strings as time goes on – when you feel that you’re ready. If you’d like to learn more about what I do as an online guitar teacher - visit my website and start looking through my Guitar courses. There are dozens of lesson plans all with very detailed videos along with PDF worksheets that you can download and print out to start learning more about the guitar. A week ago here in the studio I gave one of my own students (who happens to really enjoy Blues), an assignment of creating a riff within the open “G” tuning. Unfortunately, he came back to his class this week and he said that he couldn’t make up anything and that he hated Open “G” and he didn’t want to even use it anymore. 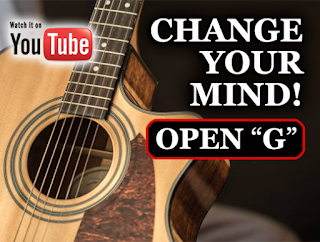 First, let’s get our guitar into Open “G.” This tuning uses a set-up that involves dropping the pitch of the; 6th, 5th and 1st strings by way of a whole-step. The end result is a tuning that goes from 6th to 1st string as; (D, G, D, G, B, D). 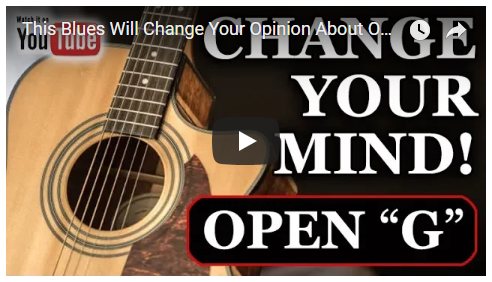 Well, I hope that this lesson on getting into using the tuning of “Open G” for playing Blues was fun for you... If you’d like to learn more about how to further develop your guitar playing - join my web-site as a free member and start taking a look at all of my “Guitar” Courses. My courses cover a ton of specific information on improving general and advanced playing skill. I’ve got a wide assortment of lesson plans and they all come with very detailed videos along with PDF worksheets that you can download and print out to start covering all types of; exercises, Music Theory, rhythm training and technical drills. The lessons are all well planned and easy to follow – and they work in a very organized way. To help you get better at playing guitar. I’ve spent years creating hundreds of detailed step-by-step guitar lessons for my website members that cover beginner to advanced ideas to help you improve your playing. Want to Reduce Wrong Notes? Here's How!